There have been a number of rigging questions recently that relate to the belaying of lines at the sides of the ship and the presence of a pinrail abaft the mainmast. When the rig of Vasa was restored in the 1990s, pinrails were mounted against the top timbers in this location for belaying the main sheet and other lines. We now believe this to be incorrect. In 2006, we removed the starboard reconstruction (which involved dismantling some of the bulwark planking) to see what evidence there was. A longitudinal timber had indeed been mounted in this location, in shallow notches across a number of top timbers. It had been fastened in place with two bolts and a number of nails. After looking at all of the evidence, we believe that the fitting in this location is a large horizontal cleat or possibly a kevel for the main sheet. A pinrail does not work here, as it would be in the way of serving two of the guns and there are not that many lines that need to be belayed here. So ignore what is shown on the plans we sell and what you see from the visitor's gallery! There may be another kevel or timberhead mounted farther forward, at the break in the railing at the after end of the waist, but we are not sure of its form. The revised reconstruction will be described in more detail in Vasa II. This is very interesting news, Fred! Thanks for the information. I'm really looking forward to the detailed drawings in Vasa 2. Fred, how big would you guess this cleat or kevel was? It was held in place by two bolts and spanned about six frames. I can measure the length of the base exactly, but the length of the horns is unknown. I would guess something like 50-60 cm. This is one of the pinrails you mean right? Should there be any others? BB has two at the foremast also. Landström has even more of them on one of his plans. 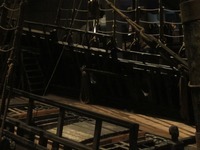 Older reconstructions tended to show Vasa with lots of pinrails mounted to the inside of the bulwarks, but there were none. Instead, the pins were mounted firectly in the caprails. If it helps: there weren't any pinrails on the Dutch ships of the 1660's either. All ropes were belayed on pins in the cap rails. The Gent-model and the Hohenzollern-model do not show any pinrails except for the very large pin rail (if you would like to call it like that) on the inside of the beakhead bulkhead on the forecastle. Here are some pictures of the clean insides of the quarterdeck and the belaying pins in the cap rails. Also a picture of the beakhead bulkhead 'pin rail'. All of the Gent-model. In my opinion the situation on the quarterdeck and forecastle of the model can be compared to the situation on the upper deck of Vasa. Please correct me if I'm wrong Fred. Cheers for posting the great pictures also!